The 38th Annual Tokyo International Boat Show Participation and Press Briefing - News Releases | Yamaha Motor Co., Ltd.
Yamaha Motor Co., Ltd. (YMC) will participate as an exhibitor in the 38th annual Tokyo International Boat Show to be held from February 10-14 at the Tokyo Big Sight in Koto Ward, Tokyo. This boat show offers Yamaha Motor a venue for presenting not only the main products of its extensive marine lineup which answers the diverse need of today's many forms of marine leisure recreation, but also our wide range of marine-related businesses and services. At the Yamaha press briefing planned for February 10, presentations will be made concerning the company's approach to its marine businesses, product summaries and explanations of our promotional activities. Number of exhibiting companies: 152. This year, for the first time, all sailboats by the different makers will be displayed together in a separate area. Yamaha will exhibit six sailboats designed for a wide range of needs from racing to cruising, as well as an information counter introducing our yachting school and race programs. As its official press presentation for the 38th Tokyo International Boat Show, Yamaha Motor Co., Ltd. will hold its Press Briefing beginning at 11:00 a.m. February 10 (Wed.) at the Yamaha booth. 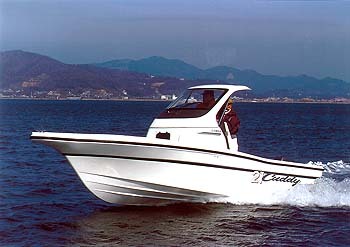 In addition to the development, manufacturing and sales of a wide range of marine products such as powerboats, sailboats, personal watercraft and outboard motors, Yamaha Motor Co., Ltd. is also involved in nationwide promotional activities such as boat licensing schools, our SRV Rental Boat Club and management of marine sports clubs, all aimed at providing users with entry-level access to marine leisure. Furthermore, Yamaha is working to help create a more pleasant and attractive world of marine leisure through widespread involvement in such areas as improving pleasure boat berthing and storage facilities. At this boat show, Yamaha Motor has prepared the largest booth area by any participant maker. This year's theme, <Life with the Sea - Navigator to Your Heart>, represents the full diversity of today's marine leisure world. Yamaha displays an exciting range of 17 powerboats, six sailboats, two jet boats,seven personal watercraft models, 20 outboard motor models and one marine diesel engine. There will also be information counter introducing Yamaha's boat licensing program, the Yamaha SRV Rental Club and its range of other school and event programs. The Yamaha booth is divided into seven zones: the (1) New Model Zone, (2) Entry Boat Zone, (3) Fishing Boat Zone, (4) Mid- to Large-size Boat Zone, (5)Jet Zone, (6) Marine Engine Zone and (7) Information Counter. Yamaha also has a separate zone in the sailing yacht booth (jointly organized by the various sailboat makers) and a marine accessories booth. Displayed here are; an outboard-mounted version and a diesel engine version of the "FC-26" family fishing boat which combines stylish exterior with outs tanding on-board comfort; the Cuddy (small cabin) version and a 4-stroke F100A out board-mounted version of the popular fishing boat "Fishing Mate 23;"and, as a special exhibition model, the 21-ft. "UF-21 Cuddy HT." Displayed here are; the new 4-stroke outboard-mounted package "SRV23EX" scheduled for release on Mar. 1; the "SRV20WB" specially outfitted for wakeboarding; the convenient "AF-9J" capable of being stored in a light van and the two inflatable boats, "YAM-300F" and "YAM-360F." Displayed here are the "UF-33I/B-HP," a new high-powered inboard version of the UF-33 (the largest of the UF series of fishing boats with deck layouts designed with all-around fishing space) and the "UF-25S/DLTD," a diesel engine version of the UF-25. Displayed here are four middle and large-size boats designed for offshore cruising and fishing and comfortable, spacious, on-board cabin living at ports of stay or your own home port. Displayed here are two models of the Exciter jet boats, popular for their unique, jet-propelled riding feeling and seven models of Yamaha personal watercraft spanning the needs of everyone from beginners and families to expert riders. Displayed here are a lineup of 2-stroke and 4-stroke outboard motors and marine engines ranging from 2 hp to 250 hp. These motors are designed to answer a broad range of user needs in both the pleasure and commercial markets in a wide variety of environments. 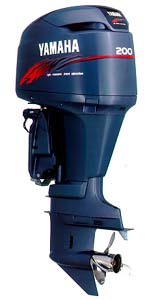 As a special exhibition model you will see the up-coming HPDI-200, a 200 hp 2-stroke V6 outboard featuring Yamaha's new High Pressure Direct Injection technology. This model achieves up to 30% better fuel economy than conventional 2-stroke outboards while also clearing the US's EPA2006 emissions regulations. At this counter, people who want to get into the world of marine sports and leisure can find information about a wide range of Yamaha programs for boat licensing, boat storage and the SRV Rental Club for people already holding boating licenses. Six sailing yachts are displayed here, including four Yamaha boats built with our proven design technology and race experience by builders of Japan's America's Cup challenge boat and winners of the Whitbread Round The World Race. You will also see two "SUN ODYSSEY" series cruising yachts imported from the French maker, Janneau. Displayed here are a wide assortment of accessories for marine leisure, ranging from accessories and parts for outfitting your boat to original marine apparel. We hope these products will answer all kinds of hardware and software needs.